Techniques for getting everyone to the finish line. Do you have students who always take longer to turn in assignments, or never turn them in at all? While everyone learns at their own pace, managing slow workers can be a challenge, especially as curriculum demands increase. Even under ideal circumstances, it’s difficult to cover everything. And when some students aren’t completing the work, you may wonder if they will ever hit their benchmarks. Of course, when it comes to knowing how best to support our slower-working students, teachers must step back and evaluate each student’s situation completely and thoroughly. What are some other possible circumstances prohibiting the student to complete his/ her work? How does the location of student’s desk in the class affect productivity? Looking at this student’s academic and social history, is this behavior typical for the child? Does this student have other learning needs impacting his or her ability to complete classwork? How does this behavior compare to the student’s work in other classes? Once you have the answers to these questions, it’s time to decide how to proceed. It’s always a wise first step to reach out to the child’s family to let them know you have a concern. Send an email or try calling home. Perhaps all this student needs is a little gentle nudge from home to get him moving on his classwork. If the family isn’t supportive, or if the family is also at a loss as to what to do, it’s time to reach out to other professionals in the building. Can the counselor lend a hand? The special education coordinator? The reading specialist? You need to do what you can to assemble a team of professionals to hold this student’s support net, and you need to start soon. Make sure assignments are relevant and varied. Let’s be honest: worksheet after worksheet after worksheet is boring and monotonous. Who wants to do ten worksheets in one day? No one. Instead, make sure that you are filling the day with a variety of activities for students: group and independent activities; worksheets and hands-on activities; online and offline activities. Add “Buddy Helper” to your job chart. If you use a classroom job chart with the typical paper-passer, messenger, recycler, pencil sharpener, teacher helper, and the like, then consider adding “Buddy Helper” to the list. The Buddy Helper can be the student who takes time—after his own work is finished—to walk around and help others when they need it. Perhaps if every student had the chance to lend a hand, even your slower finishers would speed up a little on the days that they were the Buddy Helper. 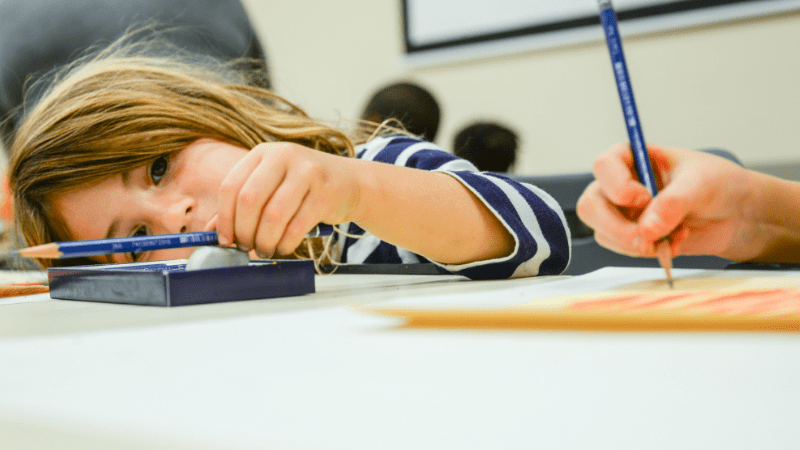 A digital timer on the Promethean board can be a game-changer for elementary schoolers since so many students of this age lack the ability to conceptualize time. No smartboard? No problem. Grab a large digital timer that you can put near the front of the classroom. If you’ve got a handful of slower finishers, consider giving each student a small, simple timer to help her keep track of time. Sometimes, it’s just hard to get started when you’ve got a big project at hand, and the same is true for our students. Students who need more of a nudge to complete work will most likely freeze when faced with a 5-step assignment. Instead, break these biggie assignments into mini-tasks for these students, giving them one piece at a time. Step back and ask yourself: Do the students really need to complete all of this classwork? If there’s something that can be adjusted so that the playing field is more level, then go ahead and adjust. Some teachers use tickets, clips, marbles, or stickers as incentives to have students complete their classwork. Perhaps when each assignment is completed, a student receives some sort of token, tokens are placed in a special jar, and at the end of the week, there’s a drawing for a special prize: a lunch bunch, extra iPad time, or a chance to sit in the teacher’s chair for part of the day. We definitely don’t want to celebrate careless work, though, so make sure you’re clear about expectations if you go this route. Ideally, school is a perfect union of support from school and home, but we know it doesn’t always work that way. If families are willing and able to help from their end, then consider using a daily sign-in chart. This chart can be a simple sheet of paper with a box for each day of the week. The student may earn a smiley face, a neutral face, or frown face, depending on the work that they complete. We want this chart to be minimal work for the teacher but to be a consistent tool for families to know how the student performed that day. If the child worked hard and finished work, then maybe there’s a small reward at home. If not, then the family can proceed accordingly. Let us know what works for you. 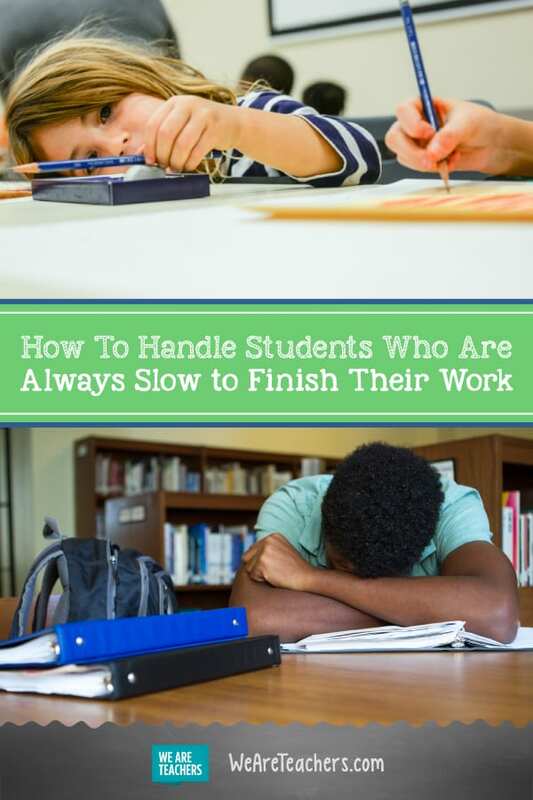 How do you handle students who work more slowly in class? Our Facebook groups are filled with teachers sharing tips and tricks, and we’d love to hear your ideas, too. Please head to the WeAreTeachers Chat group to let us know how you handle slow finishers. Plus, how to build rapport with students.